People are 100 times more drawn to pictures and images over words. Pictures easily evoke emotions, curiosity, and the need to dive right into an image and learn more about that exact moment in time. Growing up, I have always enjoyed photography and art as a way to be connected to distant people and places. Photography and painting (including other various forms of art) are beautiful in that they capture both the interpretations of the artist or photographer as well as the emotions and history of the scene that is being depicted. Through images, the viewer is able to get a sense of what the artist is trying to portray within an image as well as allow the viewer to interpret the artwork through the lens of their own menagerie of experiences. Microscopy (the use of a microscope) is another form of art that involves taking pictures or images. Through a microscope, one can image microscopic structures such as a mouse brain, small fruit fly, and even single living cells. By adding in color-encoding protein tags (also known as fluorophores) that fluoresce upon being hit by different wavelengths of light, color and context can be added to microscopy images analogous to a painter using multiple shades of color for shadowing or depicting different objects within an image. So why am I telling you all this, right? I’m telling you this because I am a photographer by hobby and a scientist by training, and this has led me down a specific path within science to some incredible experiences. I bought my first real camera when I was an undergraduate living in Tampa, FL. As a Marine Biology major at the University of Tampa, I took a course that led to a research opportunity, albeit unrelated to marine science. 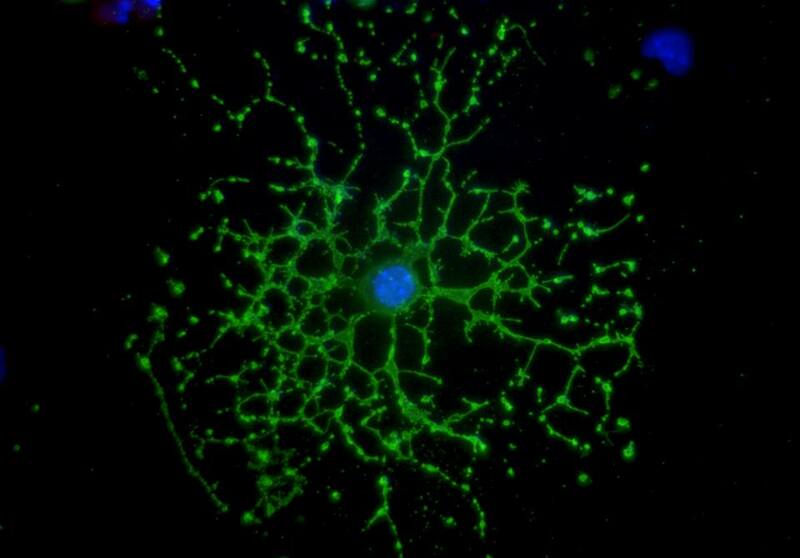 The research opportunity was to observe a virus which infects mouse cells, specifically cells within the brain called oligodendrocytes (see image to right). This research involved using microscopy as a tool to understand how our own human cells work. By spending hours in the microscope room taking vibrant, colorful images, I was hooked. Obtaining unexpected results from a microscope image motivated me to try to understand those results. The uncertainty of what I’d see on each new slide felt exciting, like the thrill of entering a new level within a game or traveling abroad. Like most undergrads that have caught the research bug, I knew I wanted to pursue some aspect of science but had difficulty picking a single field when it came time to apply to graduate school. By taking my love for science, photography, and animals, I was able to combine all three of my passions into a direction that I wanted to head in: going to graduate school to study viruses that impact animal cells utilizing microscopy. Thus, not only do I consider myself a photographer of wildlife, but I am also a photographer of the microscopic processes that allow these organisms to exist. It is through microscopes that I can capture a relativity unknown process within an image and publish it or display it to the public and allow the viewer to interpret and be inspired by it. This is what I work towards accomplishing within science. In the simplest of terms, with microscopy, I can look at one cell, or two cells, make a red cell or a blue cell and inspire new schools of thought within a field of science and excite our youth about science as well. How cool is that? Older PostWhere passion meets purpose: Science, mentorship, teaching, and art.